I was that way, but it's somewhat disappeared of late. I still appreciate such things, but it's not a passion anymore. I basically grew up in Rockland County , but like many others we were from The Bronx ( Pelham section ) and would frequent relatives there . ( Orangeburg is where I grew up .... other side of the Tappan Zee Bridge which you should Google because the bridge is now gone and replaced ) and I live in Tappan now . Marble Hill Projects I would frequent as a kid as my father was a plasterer for New York City Housing Authority ( N.Y.C.H.A. ) He became a field supervisor for those Housing Projects , Marble Hill and Jackson Houses were his territory . Slot car tracks ..... the closest one was in Closter N.J. which is a 7 minute drive from my area . remember how big those cars were ? ....lol What a way to grow up .... these kids today will never know . Sing Sing was north in Ossining , N.Y. ( north of the bridge as I'm sure you're aware ) I was an electrician years ago in Westchester , Local 501 I.B.E.W. and we did some work there . You had to guard your tools at all times or the inmates would steal them .... among other things I did a lot of work in Getty Square , Mt Vernon also but never worked at Yonkers Raceway which brought a lot of union work back then . Alberta_Slim, new6659 and larryr like this. Well maybe not now, but in the 60s yes. Tappan Zee bridge gone? Wow . I did have a 38 special stuck in my face when I was young in Getty Square. Ah the memories. And of course Freedomland, now co-op City. You do work there? My last address living in the Bronx was on Carol Avenue. Update from the net:" Where once railroads such as the New York Central, Delaware & Hudson, Pennsylvania Railroad, and many others moved freight and passengers to and from New York"
Why is it, that when some idiot tries to beat a train at a crossing and gets hit and killed, it becomes the train's fault? It's a far too common occurrence, and it's not like the train sneaks up on you, or jumps out from the bushes. A radio personality was killed a day or two ago when he was hit "while jogging along the tracks, while wearing earbuds". First of all, train tracks and right of way are private property, and he was trespassing; secondly, wearing earbuds means he couldn't hear the train's horns. Sad that someone died, but it's hardly AMTRAK'S fault. I really do not have any sympathy for those who go around crossing gates, or ignore signs, flashing lights, bells horns or other warnings and get injured due to their own stupidity. I truly feel sad for the engineer that will relive the moment of someone's death (suicide by train?) for the rest of his life. Read where some idiot said that train's need better brakes. He had absolutely no idea of the physics involved---metal on metal coefficient of friction, the immense weights (he thought that train cars weigh as much as semi trucks) and the fact that a train at speed takes over a mile to stop. Considering that the engine alone weighs 500,000 pounds and more, the fact that they stop as fast as they do is amazing. I know that I actually annoy some folks by stopping as soon as the lights start flashing. I want to watch the train, actually. I had someone go around me once at a rural crossing. He and his wife didn't survive. The South Shore interurban was doing nearly 90 MPH The usual delay was not much longer than dealing with a stop sign. Having seen the results first hand, right in front of me made me a believer. Alberta_Slim, new6659, thunder58 and 1 other person like this. Good points, Wabash. Engineers are at risk to experiencing PSTD from being involved in accidents over which they have no control. As Wabash pointed out, trains don’t exactly stop on a dime. The kinetic energy of a speeding train is beyond the comprehension of almost anyone. A big part of the engineering involved in being a railroad Engineer is calculating and understanding the power required to climb this up-grades, but even more important, the dynamic blacking power required to control speeds on the down-grade sections. It’s not simply being a throttle jockey. There was a derailment, some years back, when someone misreported the weight of some dry bulk hoppers and they were unable to manage the energy on a long downhill section. In the space program, they used to say that Sir Isaac Newton was in the driver’s seat, because it was all about balancing energy (momentum) against gravity. Every burn was calculated, go to fast and you’d end up stranded in space with no way to slow down enough to ever go home. Too slow and you’d reenter and land wherever the laws of physics decreed. The same laws apply everywhere, but when we drive a car or manage the energy of motion in our everyday lives, the speeds and amounts of kinetic energy involved are a tiny fraction of that which is involved with a train. The bottom line is, a train moving at speed has a lot of energy to dissipate in order to stop. They simply can’t stop in a short distance. Alberta_Slim, wabash slim, thunder58 and 1 other person like this. Alberta_Slim and larryr like this. Yes, as a child I loved trains. My middle son would get so excited when we got stopped at a train crossing, he would vibrate with excitement. It brought me back to the simple times. Unfortunately, this has not always held true, it seems that there is a lack of courtesy by the Train Companies when it comes to blocking intersections, frequently they have held up traffic for 20 minutes to 40 minutes. I understand the value they provide by moving a lot of goods, but we also have to get to work, run errands, and get on with our lives. Two minutes, five minutes is acceptable. I guess are more sensitive because our old city was build surrounded by train tracks. In the 1800's when it was built it seemed to be a good idea, and actually as a result, there were no bank robberies, because the robbers never knew if they would get trapped. We are still grid-locked on three sides, so getting to the open road is not easy. I try to avoid the crossings as a form of stress reduction. Alberta_Slim, thunder58, new6659 and 3 others like this. If you're going to run tracks, why would you do it with ear buds on? I've walked tracks all my life and never got anywhere close to trouble. This is avoidable folks. Read where some idiot said that train's need better breaks. He had absolutely no idea of the physics involved---metal on metal coefficient of friction, the immense weights (he thought that train cars weigh as much as semi trucks) and the fact that a train at speed takes over a mile to stop. Considering that the engine alone weighs 500,000 pounds and more, the fact that they stop as fast as they do is amazing. And the fact that every car has it's own brakes - they've done everything they possibly can. Railroads are fraught with danger, no way to avoid it except...avoid trains. Me too - I like to sit and enjoy it go by. And I'm thankful it tells me so I know to stop. Alberta_Slim, wabash slim and thunder58 like this. When I first got to Tennessee, I did some substituting on bus routes. To keep up our CDL, we had to do a yearly in-service, and for the last one I attended they had an engineer speak to us. He gave us quite a talk about safety around railroad tracks, along with the gruesome details of the times when trains meet passenger vehicles. He also talked to us about the emotional scars that the engineers bear, because there is usually a fatality. He went on to tell us about one in particular time when he was traveling through his hometown in the morning. It was the time that parents were hurrying to get their kids to school, and one vehicle decided to go around the gates (something he had already covered as a "never, ever, ever do). The engineer's train just barely missed the car, as he had panicked trying to slow the train. It wasn't until he passed the car without hitting it that he realized the car looked very familiar. Yep. He called his wife, and confirmed that he nearly killed his wife and 2 children, because she was in a hurry. I can't even begin to imagine how that moment messed with his head, but it was why he retired from driving the train, and spent his time doing safety talks. Alberta_Slim, stevo, thunder58 and 2 others like this. I live in Northern Colorado and have taken the California Zephyr many times between Denver and Emeryville, CA (SF Bay Area). It looks like I might be riding out again next month. I've also taken the train from Skagway, AK up to the Canadian border and back. That's an amazing journey. That train, when it was built, changed everything up there. My kids loved trains. 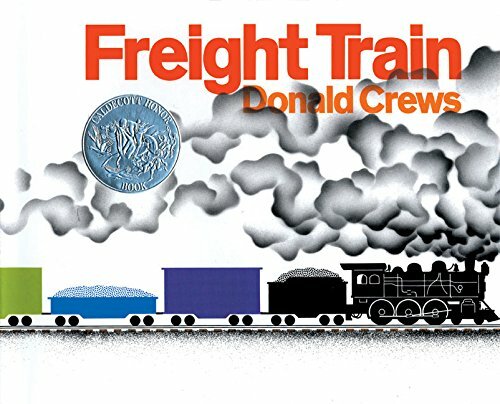 Freight Train was a favorite book when they were toddlers, I loved the artwork, bold colors and geometric shapes, the smoke looks really cool. Great book for toddlers. Hmm links no longer work? My daughter and I also found this picture somehow. She laughed every time she saw it: we wound up printing a copy for the playroom. Train crash from 1895.